The acclaimed author, artist and filmmaker dreams up an idiosyncratic solution to the interruptions of modern life. And there are affirmations. Be they clients over the moon with their first pair of jeans (one of the BEST parts of my job), passing compliments from strangers, words of encouragement from friends and mentors following your progress, or milestones reached. And then there are AFFIRMATIONS. Like winning an Emerging Designer Competition, getting a thumbs up and a bear hug from Fern Mallis, or having a new friend capture the spirit of your business so beautifully, so thoughtfully, that you take note of another miracle-- that you've been given the opportunity to live life as you choose. Kathryn Stewart wrote a piece about Bow + Arrow for Verily Magazine that did just that, and it really made my week. A few years back, I had the pleasure of visiting a dear friend in Marfa, Texas. A host of galleries, a museum of electronic wonders, and a stark high desert landscape, a week there is hardly enough to take in all that this tiny town with big ideas has to offer. While there, I visited the studio/ storefront of boot making couple Colt Miller and Logan Caldbeck. Cobra Rock Boot Company has made serious waves with their South Highland Boots, developing somewhat of a cult following and logging a wait list for their product that fluctuates from 6 months to 1 year. Each aspect of their boots is handmade, and though several pairs can be made at once, a single pair of boots takes two and a half weeks to make! Its this kind of dedication to hard work, fine craft, and great design that I can really get behind. And as a side note, they are also just really nice people. 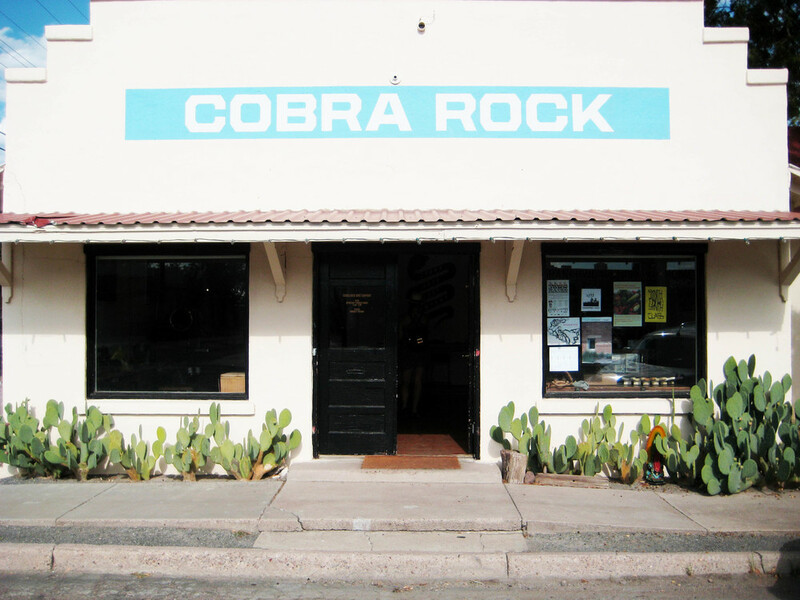 Cobra Rock Boot Company's store front on Dean St. in Marfa. On June 3rd and 4th, Colt and Logan will be coming to town with a handful of boots, some leather, and their sewing machine and will be setting up shop alongside me and my newest designs. I couldn't be happier to share in my first Pop-Up with them, and I couldn't be more pleased about the venue. Come and see us at Shelter Collective, 7 Brevard Rd in West Asheville. Can't wait! View from inside one of Donald Judd's works in Concrete. Placed along the North South Axis of the Chinati Foundation, the forms play with the light from the sun. Last night I had the pleasure of catching a local screening of an episode of the PBS show, "Craft in America" at the Fine Arts Theatre here in Asheville. A group of us went in support of a friend, Libby O'Bryan, who owns and operates a high end cut and sew operation in a neighboring town, who was featured in the episode. The piece itself was lovely, and the group of us in attendance was a host of makers, including a fine furniture maker, hand bag designer, architect, fine artist, sculptor, fiber artist, and myself. There are moments in this charmed life when I'm able to look down the table at 8 fine folks shoving tacos in their faces and say, Dang, We live in an amazing place that supports amazing people doing amazing things. And for this I am ever grateful. As icing on the cake, during the final portion of the episode I caught a glimpse of my friend and incredible milliner, Behida Dolic, wearing a pair of overalls that I custom made for her. The clip is borrowed from an Etsy video portrait that featured her and her work. I encourage anyone to take the 3 plus minutes they would have blown on Facebook to instead catch a glimpse of this woman doing her thing. Because she is amazing.